Who says you can't teach an old dog new tricks?? Bandit, the white-faced senior golden retriever that Friends of Flicka is sponsoring at RAGOM is learning all kinds of new things at his foster home and having a blast. 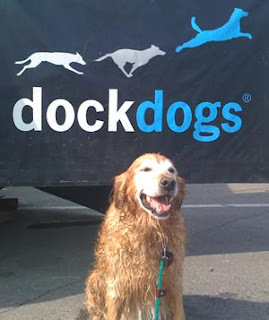 He's not likely to win a "Dock Dogs" competition for longest leap, but it's clear from his photo that he is having fun. Read more about Bandit at the RAGOM website posting dedicated to him.